Centralia's first exposure to the Industrial Workers of the World (I.W.W.) had not gone well. It was 1914 when 47 members of the I.W.W., unemployed and homeless, came to Centralia looking for food and shelter. Instead, Centralia residents were deputized, and marched the Wobblies (as I.W.W. members were commonly called) out of town to the local fairgrounds. The men went peaceably, but eight men returned to town shortly, explained that the men were hungry, and would return to town, whether they were wanted or not. True to their word, they did come back, and helped themselves to food from local stores. This time the deputized men walked the Wobblies all the way to neighboring Chehalis, where the police there met them and escorted them out of Chehalis. The passage of time did not serve to endear the Wobblies to the people of small, conservative Centralia. The I.W.W. was philosophically against US participation in W.W.I, thinking that the US should concentrate on labor problems here at home. This was generally viewed as unpatriotic, if not outright treason. Centralia didn't want these unpatriotic radicals in their town. In 1917 the I.W.W. opened a hall in Centralia, despite the sentiment of the town. Halls were imperative to the survival of the I.W.W. Unlike other unions, their membership was largely homeless, so the halls were the primary means of contact between members. However, once the landlord of the Centralia hall discovered that he had rented to the radical I.W.W., they were evicted. Rather than give up, the I.W.W. found a new location for a hall in Centralia. They were convinced that Centralia, in the middle of lumber-working territory, was an important place to be. A year later, the hall was raided in the middle of a parade to support the Red Cross. Several marchers left the parade, stormed the hall, led the Wobblies into the street, and proceeded to destroy the hall. 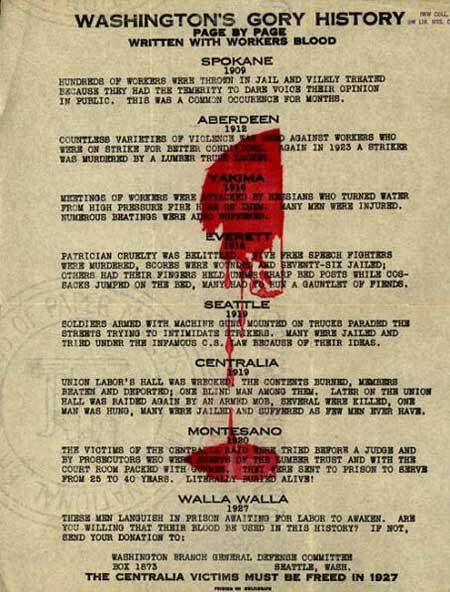 The Wobblies were taken out of town, and similar to the events preceding the Everett Massacre, forced to run a gauntlet between lines of local businessmen who beat them. Later in 1918, Tom Lassiter, a blind man who ran a newsstand in Centralia that carried I.W.W. materials as well as other papers viewed as subversive, was forced into a car and driven into the next county. He was told not to return. Not only did he return, he also continued to sell the radical papers. Shortly after his return, he was arrested, although never charged with a specific crime. In addition to being viewed as unpatriotic, the I.W.W. was also vocal in its support of the Russian Bolsheviks, which made civic leaders throughout the country wary of any and all Wobblies. Throughout the country, I.W.W. members were regularly arrested and convicted of federal sedition charges. This was the background of Centralia's relationship with the Wobblies when they found a new hall (to replace the one previously raided) in 1919. Rumors that the new hall would also be raided soon became so commonplace, it was more a question of when a raid would happen, not if it would happen. Not surprisingly, the Wobblies were concerned. Local lawyer Elmer Smith, sympathetic to the Wobbly cause, suggested going public about their fears of being raided in an attempt to gain public sympathy. The Wobblies took Smith's advice and distributed a leaflet, but this effected little change in the views of the general populace of Centralia. It soon became expected that the raid would take place during the November 11, 1919, Armistice Day parade, presumably hoping to mimic the success of the raid during the Red Cross parade. This parade was to be a patriotic event, with all marchers in uniform, and flags encouraged. The rumors of an Armistice Day raid seemed so likely that the owner of the building that now housed the I.W.W. hall even went to the police, asking for help, but was promised nothing. Local I.W.W. leader Britt Smith returned to lawyer Elmer Smith (no relation) for advice on defending themselves. Elmer Smith advised that it would be legal for the Wobblies to defend themselves, if attacked first. The Wobblies then held a meeting, and decided to secretly arm themselves with guns. They even went so far as to decide in advance to place armed men in two or three different locations from which they could view the hall during the parade. Seven men were to remain in the hall during the parade. During the parade, not unexpectedly, the Centralia Legionnaires slowed to leave a gap between their group and the Chehalis group ahead of them. The Centralia group stopped in front of the I.W.W. hall, and a subset of the Centralia group left the main group, ran to the I.W.W. hall, and forced the door open. Much to their surprise, they were met by gunfire. There is little doubt, from later testimony, most notably that of Dr. Frank Bickford who admitted leading the raid, that the Legionnaires initiated the conflict. It is less clear who fired first, but it seems likely that the Wobblies fired first. In any event, shots soon came from all vantage points. Warren Grimm and Arthur McElfresh of the Legionnaires were killed in this initial confusion of shots. Of the seven Wobblies inside the hall, only Wesley Everest and Ray Becker fired any shots. It is unclear, of the men posted at other stations, who or how many fired upon the raiding Legionnaires. As the Legionnaires entered the hall, four Wobblies hid in the back, and three exited out the back. Everest, still armed, was one who fled out the back and killed Ben Casagrande during his escape. Everest ran until he got to the Skookumchuck River. Trapped there, he faced his pursuers. One of the pursuers, Dale Hubbard, had by this time acquired a gun that didn't fire. Nonetheless, Hubbard leveled it at Everest, and demanded his surrender. Instead of surrendering, Everest shot and killed Hubbard and seriously wounded John Watt. Everest now had to reload his weapon, and was overcome and captured by the Legionnaires while attempting to reload. He did not cooperate with his captors and refused to identify himself. Rumors quickly spread that he was actually I.W.W. leader Britt Smith. While Everest was being captured, the contents of the hall were taken into the street and burned, with the exception of the membership list which was given to the town prosecutor. The other men from the hall were more easily apprehended than Everest, as were most of the men from the other locations, although one man, "John Doe Davis" was never found. Mike Sheehan, Ray Becker, Bert Faulkner and John McInerney had hidden in a cold storage locker, and surrendered themselves quite quickly. John Lamb, Dewey Lamb, and O.C. Bland were captured later the same day at the Lamb home. When the still-anonymous Everest was marched back into town, a group of citizens tried to lynch him on the spot but were stopped in their attempt, and Everest was taken to join the others in jail. Elmer Smith was jailed as well, on the grounds of his sympathy to the I.W.W., and for his disapproval of US involvement in W.W.I. Centralia was now in a state of shock, and public hysteria began. Four men had been killed, and one more, John Watt, was in serious condition, although he would ultimately survive. That evening, someone pulled a switch at the power distribution site, and all the lights in the city went out. At the same time, a group broke into the jail, demanded keys to the cells, and forcibly removed Wesley Everest. He was driven to a bridge over the Chehalis River, mutilated, hung, shot repeatedly, and left hanging. Although it is without a doubt that Everest was the one who killed two of the Legionnaires, he was still anonymous at the time of the lynching. It is generally suspected that he was lynched because of the rumor that he was leader Britt Smith. In reality, Smith remained safely in jail. Neither city undertaker would take Everest's body, so it was taken back to the jail, where the remaining prisoners were given the task of building a coffin and burying him. City prosecutor Herman Allen said he would prosecute the lynching, if provided the evidence, but no such evidence was ever gathered. In the growing hysteria, anyone with even vague I.W.W. connections or leanings was jailed. In the search for Wobblies, two groups of vigilantes, each unaware of the other group, converged on an empty cabin. Each group believed that the other group were Wobblies, exchanged gunfire, and John Haney was killed. On November 13, 1919, 16-year old fugitive Loren Roberts surrendered on the advice of his mother. Bert Bland was captured on the 19th. After Bland's capture, things became somewhat calmer in Centralia, but the hysteria had only begun statewide and nationally. It was not common knowledge that the hall had been raided before the gunfire, and the general public believed that the radical Wobblies had fired into a peaceful, patriotic parade. Wobblies in logging camps throughout Washington State were arrested. The US Attorney advised holding all suspected I.W.W. members throughout the nation on federal charges. Washington soon passed a law making it illegal to belong to the I.W.W. Many feared that the Centralia Tragedy or the Armistice Day Riot, as it had come to be known, was a planned piece of a larger conspiracy. No lawyer in Lewis County would defend the I.W.W. members facing trial, so Ralph Pierce came down from Seattle. Pierce was an associate of George Vanderveer, who had so ably defended I.W.W. members after the Everett Massacre. By the time Pierce arrived in Centralia, many of his clients had already given statements. Loren Roberts and Tom Morgan had been especially talkative, Morgan so much so, that the charges against him were eventually dropped. Since Everest, the known killer of Casagranda and Hubbard had been lynched, and John Doe Davis, the suspected killer of McElfresh had disappeared, that left only the murder of Warren Grimm to be tried. Eugene Barnett was one of the men posted in one of the other buildings looking down on the I.W.W. hall, and it was he that the prosecutors decided to try for Grimm's death. The others would all be charged with conspiracy to commit murder. George Vanderveer took the case over from Pierce at this point. The trial was held in Montesano, since it was quickly agreed that a fair trial could not be obtained in Centralia. Vanderveer did not believe a fair trial could occur in Montesano either, but his motion to move the trial to Olympia was denied by Judge John M. Wilson. Vanderveer's attempt to have the men tried separately, rather than together, was also denied, as was Vanderveer's appeal of these decisions. Nor did the judge allow Vanderveer to discuss any of the incidents that had happened to the Wobblies in Centralia previous to that day. The trial, held in 1920, was a huge event for the small town of Montesano. Thirty-four Legionnaires were deputized for the event. Legionnaires were also paid and provided with shelter to attend the trial. The US Congress even passed an act allowing ex-servicemen to wear their uniforms, so these paid attendees appeared to be quite official. The American Federation of Labor (A.F.L. ), a far more conservative labor organization than the I.W.W., was shocked at what clearly seemed to be attempts to influence or bully the jury, sent a 6-man 'jury' of their own to attend the trial. In the middle of the trial, a US Army infantry regiment arrived, at the request of Prosecutor Herman Allen, ostensibly as a 'precautionary measure', but more likely as a further means of jury intimidation. On a more optimistic note for I.W.W. supporters, part way through the trial, the judge unexpectedly dropped the charges against one defendant, 21-year old Bert Faulkner, possibly because his mother attended the trial daily. This left 10 men on trial. After six weeks of testimony, the trial ended and the jury went into deliberations. Their first verdict acquitted Elmer Smith and Mike Sheehan, found Loren Roberts insane, and found the others guilty of third degree murder. The judge rejected this verdict, saying there was no such thing as third degree murder, and sent them back for further deliberations. Two days after the initial deliberations began, a final, acceptable verdict was reached. Smith and Sheehan were, in fact, acquitted, Roberts was declared guilty but insane, and the other seven were convicted of second degree murder. Interestingly, all 12 jurors signed a petition requesting leniency for the convicted men. Judge Wilson disregarded this plea and sentenced the eight men to 25 to 40 year sentences, far more than the 10 year standard sentence for second degree murder. The verdict and the sentences were almost universally disliked. The supporters of the Legionnaires thought it too weak, and the I.W.W. supporters thought it too harsh. Prosecutor Allen re-arrested all the men, with the intent of trying them for McElfresh's death. Vanderveer requested a new trial, but that plea was rejected. Vanderveer appealed the case to the State Supreme Court, where the appeals were also rejected, as were his attempts at gaining a rehearing. Vanderveer had no other options left. The eight men were sent to prison, or in the case of Roberts, a ward for the criminally insane, and the additional McElfresh murder charges were dropped. On a sidenote, the A.F.L. 'jury' voted to acquit all 10 men. Elmer Smith, the acquitted lawyer, refused to give up. Smith became a public speaker seeking freedom for the jailed men, and created the Centralia Publicity Committee to further this cause. In 1922 Smith convinced four of the jurors to sign affidavits recanting their own guilty verdict. These jurors said they had agreed to convict the men only to avoid a hung jury and out of fear that they or their families would face repercussions if they voted to acquit. Within months, Smith had collected many more such affidavits from jurors. Unfortunately for Smith's efforts, people didn't believe that Smith hadn't pressured the jurors into making these affidavits. By 1924 witnesses to the Massacre had also begun providing Smith with additional affidavits. Several stated that they had been afraid to tell the truth at the time. Smith petitioned Governor Louis Hart to release the prisoners on the basis of these affidavits, but Hart contended that the trial had been fair, and the eight remained in prison. The main result of these affidavits was that Smith was removed from the Bar of Washington State. As time passed, and tempers and memories calmed, more and more people, though certainly not a majority, began to realize that an injustice had been done to the convicted men. Even one of the prosecuting attorneys, W.H. Abel, came to be publicly of the opinion that the men had been punished enough. In 1928 Edward Coll, a Legionnaire, moved to Centralia. He heard whispering about the event, was curious, and researched the event. Coll became convinced that the men had been wrongly convicted, and frequently joined Elmer Smith speaking on their behalf. Also in 1928, Roland Hartley was elected governor of Washington. Like his predecessor, Hartley was opposed to freeing the prisoners, but he was also beginning to be aware that the people of Washington no longer opposed releasing the men as strongly as they had originally. In 1929 several churches undertook a cross-denominational investigation into the trial of the Centralia men, led by DeWitte Wyckoff, a lawyer as well as theologian. Wyckoff's report, issued in 1930, concluded that while the Wobblies' idea to defend the hall with guns was foolhardy, it was likely that the hall had been rushed before shots were fired; that it was unlikely that Eugene Barnett had been one of the shooters; and that the police had had an obligation to protect the hall and to prevent the raid. The report also felt that the troops at the trial had been a blatant attempt to sway the jurors. Governor Hartley continued to maintain that the trial had been fair and took no action. While Wyckoff was creating this report, in 1929 Loren Roberts, who had been judged 'guilty, but insane', received a new hearing. W.H. Grimm, the late Warren Grimm's brother, was the prosecutor. Since Roberts now appeared to be sane, Grimm tried to prove that Roberts had originally faked insanity. While this was quite possibly true, the judge ruled that the jury in this hearing must accept the fact that he had been found insane 10 years previously. The jury in the new hearing found Roberts now to be sane, and freed him from serving any more time. In 1930, James McInerney died while in prison. Elmer Smith arranged to have him buried in Centralia on the same day that the national commander of the American Legion was scheduled to speak in Centralia. Smith advertised the burial well, and the day became a huge event for the town, with 2000 reported attendees. Smith had clearly made great strides in gaining public support. Also in 1930, Smith was reinstated to the Bar. The next year, 1931, Eugene Barnett was granted a six-month leave from his sentence to care for his dying wife. Governor Hartley, hoping that paroling a few of the Centralia prisoners would help with his bid for re-election in 1932, did not require Barnett to return to prison after his wife's death. Hartley also paroled O.C. Bland in December 1931. Lawyer-activist Elmer Smith died in 1932, and didn't live to see much of what he had worked so hard for. In 1933 John Lamb, Britt Smith and Bert Bland were paroled shortly after Washington's new governor, Clarence Martin was elected. Parole was also offered to Ray Becker, but Becker refused the offer. He didn't want mere parole, he wanted it publicly admitted that his imprisonment was fundamentally wrong. Becker began actively campaigning on his own behalf. At Becker's instigation, in 1936 the A.F.L. requested a congressional investigation into his imprisonment. Also in 1936 the International Woodworkers of America created a 'Free Ray Becker' committee based in Portland, Oregon. Julia Godman, secretary of this committee and friend of Becker's, took Elmer Smith's paperwork from the 1920 trial, hoping to find evidence that had been declared inadmissible at that trial, but which might be useful now. Godman also revisited the people Smith had gotten affidavits from and obtained new affidavits from them. None of these efforts got the desired result of a new trial for Becker. In 1939 Governor Martin ended the situation by commuting Becker's sentence to time served. This wasn't the vindication that Becker wanted, and officials feared he would refuse to leave jail, but this time Becker did accept his chance at freedom. Essentially, the story of the Centralia Tragedy ends with Becker's freedom. After he was released there wasn't much reason to keep the incident in the public consciousness, and the event has faded from public memory. Centralia's 1924 statue to the fallen Legionnaires is pretty much the only public reminder left of that day. There is little left to remind people of what can happen when public hysteria takes over, and when people are put on trial for their beliefs as much as for their actions.